I daily use a Mac as my main computer, although I also use a Windows computer occasionally. With time, I have grown to appreciate the ease and simplicity of the Mac, which is known to excel at media production. I rarely edit a video, but I have need to record and edit audio almost daily. Still, I found that the Mac seemed to be lacking something regarding audio. I enjoy recording gameplay but QuickTime will not let me record the audio of the computer. I can input a mic for talkover, but I cannot record game sounds with QuickTime. However, two apps from Rogue Amoeba solved all my audio needs on the Mac. Loopback let’s you route audio between apps. When you first open the tool, you create a virtual audio device. Since I wanted to record gameplay with the game audio and microphone input, I created a virtual audio device named “World of Warcraft.” I then routed the game play audio and microphone audio into this one new virtual device. In the screen recording software I could simply select this new audio device and the gameplay, as well as the microphone audio, was recorded. I can also easily add another source to the virtual device to record a group of friends playing together. You can then select this virtual audio device anywhere on the Mac as though it is a physical device. Loopback totally solved what I was trying to do. There is so much more Loopback can do. You can combine guests on a podcast with background music for an intro, etc. Loopback works with any app and any input device. The possibilities are endless. Loopback is available at www.rogueameba.com for $99. There is a free version to try that will work for 20 minutes before the sound quality is degraded. I thought it was my most used app on the Mac until the next app-- also from Rogue Amoeba. This app from Rogue Amoeba does exactly what it says. It “hijacks” any audio on your Mac. This has become one of my most go-to apps. 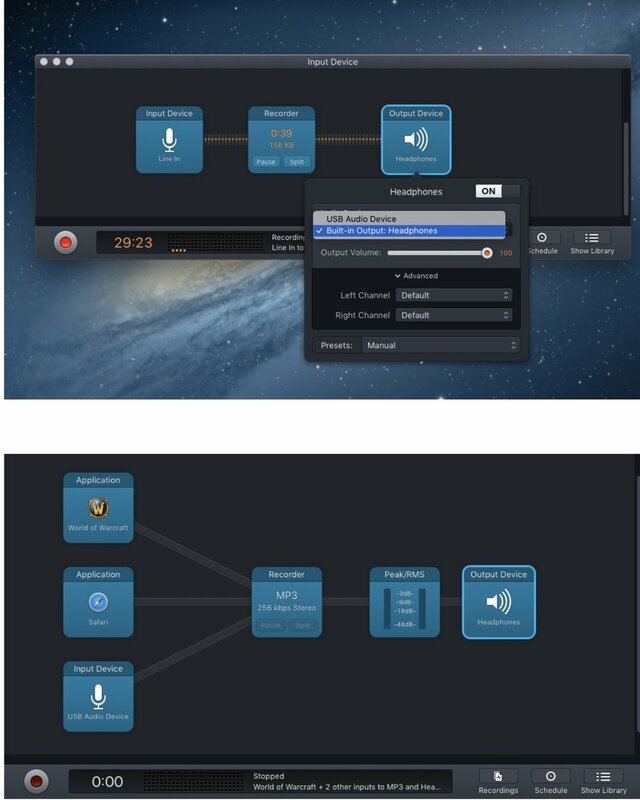 Simply stated, Audio Hijack can record any audio on your Mac. But it goes way beyond that; it’s a virtual mixer board. You can take multiple sources and combine them into one simply by dragging “blocks” onto a workspace. There are many presets for you to choose from, or you can start from scratch. You can take sources from Skype, multiple microphones, iTunes, etc. You can then combine these into a source to record. (You can even use a virtual audio device that you created in Loopback.) You can then add effects and filters at any point along the path you have created for various effects and audio level control. There are a couple of broadcasts online I like to listen to, but I’m not always at the computer. I simply set up a new blank session to record a particular URL. I then input that stream to an MP3 (or other format) at the quality I desire (Audio Hijack has presets for quality, or you can select your own.) I then can schedule that session to run at a particular time. I have it set to only record for 30 minutes. When I return to my Mac, the audio is recorded and waiting for me to listen to. If I so desire, I can then open the recording in an app to edit, etc. Audio Hijack can be set to stop recording when there is silence, which I find very convenient. I have a couple of online streams that I like to record to for later listening, but sometimes they are at the same time. This is no problem for Audio Hijack. The sessions will easily run at the times I scheduled, and each one will record perfectly at the same time. Audio Hijack will also let you broadcast to an icecast or shoutcast server. The possibilities endless with what the utility can do. I had tried recording audio on some other apps but the cpu usage would often top out at near 40%. Even with two sessions running, I often saw 8% to 9% CPU usage from Audio Hijack. Audio Hijack has become one of my most used applications on the Mac. I use it daily. I have tested recording for days, and Audio Hijack never crashes or fails to record. The group at Rogue Amoeba has some of the best apps I’ve ever used. The apps are attractive, responsive, and work perfectly. I highly recommend both apps. Audio Hijack is available for $59. There is a free trial. You can purchase Audio Hijack and Loopback in a bundle for $130 which is a $30 discount. Check these and other audio related apps at www. Rogueamoeba.com.